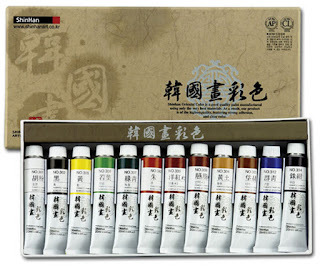 A year or two ago Jacksons www.jacksonsart.com/ introduced Shin Han watercolour paints to the UK. Shin Han are a Korean company, who like Mijello, appear to sell a range of art materials. The range comprises 72 paints and the naming of them leads me to believe they are shadowing Holbein the well-known Japanese maker. The marketing policy is to price them well below the leading makes and to get some well-known artists to promote them. One is always attracted by a possible alternative to the increasingly expensive leading makes. Shin Han looked attractive and I ordered a tube of Jaune Brilliant No.2 (PO20/PW6). Jan Weeks, one of the leading members of Avon Valley Artists, bought a tube of Mineral Violet (PV15). This is a very small sample I fully accept but I thought it horrible and Jan was not impressed with the Mineral Violet (PV15). PO20 is Cadmium Orange, PW4 white and PV15 Ultramarine Violet. There are opposing views which I will cover later. When I was able to access pigment details I was even less impressed. 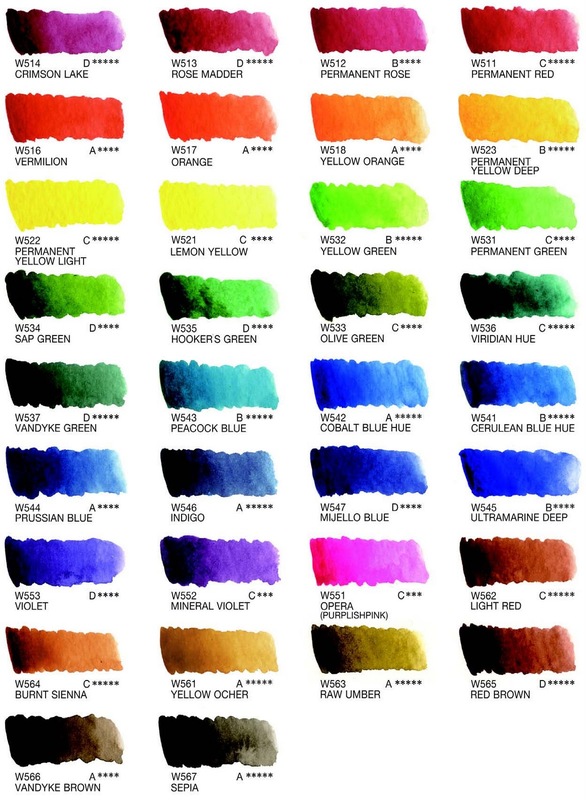 Shinhans pigment choices vary. They do utilise a number of obsolete pigments, by which I mean those that have been dropped by the majors. There are also suspect pigments that are not considered fully lightfast. White is present in 12 colours and dyes in two others. PR83 (fugitive) is used in four paints and only 20 colours are single pigment out of 72, a much lower percentage than that of the majors. The single pigment argument is one that doesn't necessarily have universal agreement. There are good pigments used in many paints so you could selectively pick out some decent paints. My overall conclusion is that Shinhans pigment choices and mixtures vary from the mainstream manufacturers, so is this an innovative company or are these examples of cutting corners on cost? Another question arises, especially when Mijello Mission Gold is included, are they produced under a different philosophy? I referred to differing views. Arnold Lowrey, the well-known Welsh artist swears by them - or he did - and a very good artist at my local group also loves them, having previously used Winsor & Newton. Some other members have bought the 32 tube box offer that works out at just over £2 a 15ml tube - about a quarter of the equivalent Winsor & Newton, and much cheaper than any other leading make. They `claim', apart from four colours including two dyes (!) classed as `Moderately Permanent', that all the rest are either `Absolutely Permanent' or `Permanent'. Personally, as a follower of Handprint, I wouldn't accept these ratings without a deal of scepticism. I suspect sales have been very good as the prices are so cheap and many artists don't bother about such things, accepting that they are `Artist Quality' as that's what it says on the tin, Jacksons give them a fulsome write up. By all means try them. They may suit you but you need to be very selective, not easy as the pigment details are difficult to find in chart form. I eventually did but it was so tortuous I can't remember how I finally succeeded. I can find no other UK source than Jacksons so why not ask them to provide pigment details? This piece was prompted by the emergence in America of another Korean make called `Mission Gold', made apparently by Mijello who also do a range of plastic palettes. There has been a high profile campaign to promote them using a professional artists(s), and an extensive thread appeared on Wetcanvas which dissected them in quite a forensic way. They aren't in the UK yet, although the palettes are, but where America goes we are sure to follow. Mission Gold is also being promoted on Youtube. I might add a third Korean brand is called Alpha. When I accessed the latter website it left a banner across my opening screen that I struggled to remove. A thread was started on Wetcanvas asking if anybody had any experience with the new range. Immediately a lady called Mary Henderson popped up, claiming to be a professional artist with thirty years experience in teaching, making the most extravagant claims. She says `Mission Gold are as fade resistant as other brands...the normal is considered 100 years (! 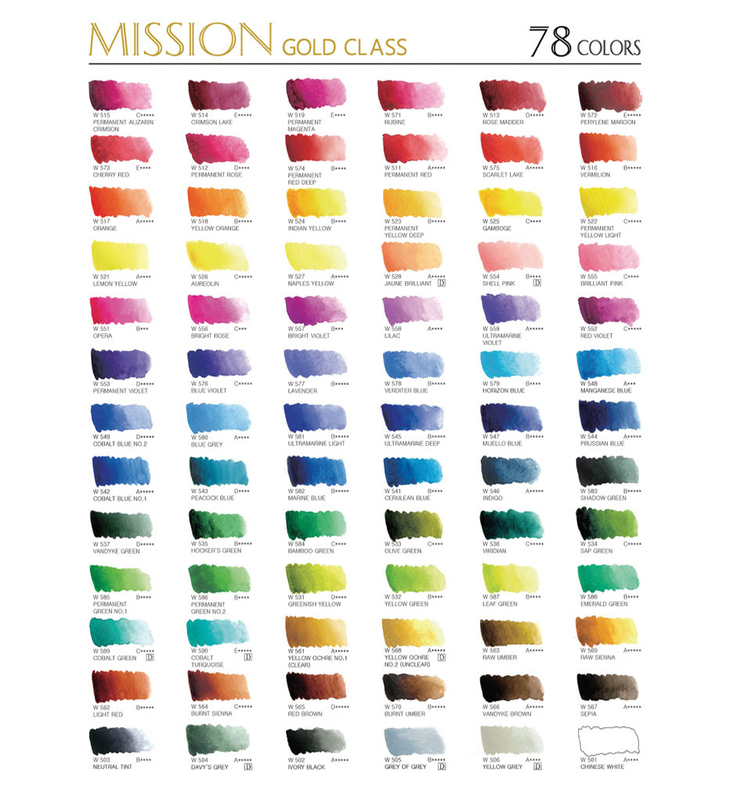 )'...I am now using Mission Gold watercolors for all my personal works and teaching. Very importantly, so are all the other professional artists that I personally know.....' and so on and so on. Somewhere else she claims they are `the best watercolors in the World'. It soon became obvious she was connected with the company, but some very strong and pointed comments did not bring any clarification. If you go on Wetcanvas go into `Watercolor' then either `Palette Talk' or `The Learning Zone' carries the thread. If you enter `Mission Gold' in the top right search window then `Forums' you'll get to it. Total number of colours = 90. 11 colours were composed of fugitive pigments or dyes. 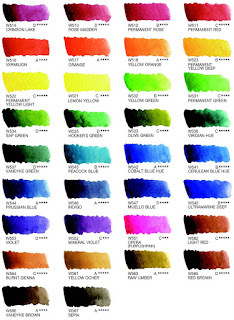 9 colours `may fade in tints, either whole or in part'. 5 colours had no pigment and/or lightfastness info. The rest of the colours had ratings of either excellent or permanent, very good, or good but names are often misleading. Examples Cerulean is made from Phthalo Blue, and Viridian from Phalo Green. A majority are mixed pigments. The conclusion from someone as particular and knowledgeable as Virgil Carter was `this doesn't look like a mature and truly artists-grade line of paints'. There is some confusion over the number of paints on offer both 78 and 90 being mentioned but I found another chart with 34 so there may be a crossover somewhere. 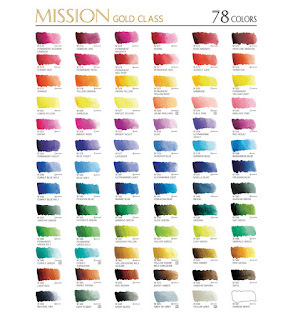 Once again some artists who had tried Mission Gold disagreed to some extent and there are many paints in the range made from excellent pigments. Another artist www.chrisbeckstudio.blogspot.co.uk/ said she had conducted extensive lightfastness tests and recommended they be avoided. Added 12/07/13. If you look at this website you will see she has created quite a furore with her tests and the company/agents have been forced to respond. It seems to me these paints are produced in a different manner to that of the European and American makers and it isn't easy to judge them accordingly. There is talk of mixing them in Geranium jars to music!!! Apart from pigments the additives are different and they seem to lean towards a more opaque result. Perhaps in this respect they are similar to Chinese watercolours like Marie's. According to the artist Lian Quan Zheng Marie's are `between watercolour and Gouache'. What conclusion can be reached from all this? Mine would be to avoid them but each to his own. Try them by all means if you are interested, if and when they become available, but always remember caveat emptor! Can't wait to get home from Switzerland to dig out my geranium jars and switch on the hi fi. Great report Peter. Switzerland! You certainly get around Mick. I bought a tube of Shin Han Viridian and was disappointed to find that it was Pthalo Green. The quality seems OK but the Pthalos would probably be the most forgiving in that respect. I think it would be unwise to buy these paints without detailed pigment information. However, as you said, a lot of people don't seem to be interested in what is in the paint they use. Excellent review Peter. The last paragraph seems to sum it up. Thanks for your investigative report. Thanks for comments Keith. Only a small percentage of artists dig into such things as pigment details. This excludes many professionals who talk about `colours' and don't know what the paints are made of. Personally I think some knowledge of what is in the paint matters. As usual Ray many thanks for your comments. Great post Peter especially as I was wondering abut getting some!! All the supplier write ups are bound to promote them and it is so easy to be seduced into buying something when you are an art supply junky like me!! Have just got a starter pack of Maimeriblu, KB has started stocking them so thought I would try them out, am really sorry they have stopped selling Schmincke, such a shame as I really like their paints and they were a really good price so am hoping I like these new ones. Thanks for comments Judith. I'm sure you will like Maimeri but don't buy the Golden Lake! Avignon Orange is a great colour - same pigment as W & N Brown Madder. Watch the pricing though. I covered this in my Watercolour Painting on a Budget Pt2. Series 1 and 2 are well priced but 3 & 4 not so much. Both Jacksons and Great Art sell Schminke at keen prices. Peter excellent post. I had thought about getting some of those paints but I've held back. Judith - On occasion, I use Maimeriblu, but only the primary colors. They're great and last a long while (In fact, I have to order a few more tubes of those colors). Hi Oscar. I imagine a lot have been tempted but.... Thanks for comments. Thanks for a great review! I'm trying a Swedish brand faetus and have written a few short posts about it. I'd like to see it in the stores one day but competition will be hard, as watercolor painters are so unforgiving when it comes to quality. Thanks for comments Mans. I've never heard of faetus. The thing is there are such a large number of quality paints already available. I don't believe it possible to supply the same quality at a fraction of the price. Thanks for this discussion. In my 2012 book The Painter's Studio Handbook, Bloomsbury, I discuss the importance of knowing our paints. Thanks Simon for comments. I haven't tried Jacksons own brand but understand they are made by Sennelier. At least they were prior to the recent Sennelier revamp. Thanks for the honest review. The set is currently on sale online in one of Singapore's art supply shops. It is tempting to buy them but then I guess I have to stick to Holbein. I hope you got the Shinhan range of paints right. The one that you shown is their Korean Paints range, which isnt really watercolour. 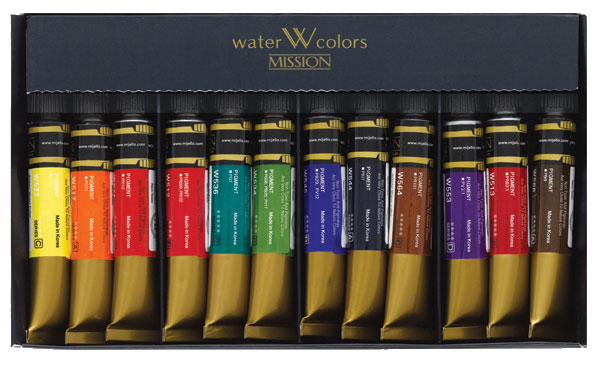 And then have 4 different types of watercolours in their in their watercolour range, which include a student grade, a professional grade and 2 artist grade which one is the premium extra fine. And the Artist premium extra fine series is pretty rare. s being sold in the UK. This is described by Jacksons as 'Shin Han Premium Watercolours' and is listed under watercolour. None of these others you mention are available in the UK as far as I'm aware and I've never previously heard of them. If they aren't watercolours what are they? 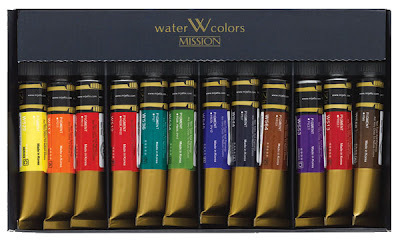 Have you every revisited the Mission Gold watercolours? the whole range had been reformulated and seem to be much better than the original pre-2013 paints. i have bought the 34 colour set in November 2016 (ebay @ $99). colors are extremely bright although the yellow ochre and burnt sienna don't look anything like the traditional. and the colalt blue and cerulean blue as well... otherwise some really great colors. in general seem to be good paints now. currently using 24 of the colors in my palette and i'm happy with them. I would only saythat if you're goingto sell your work then you have a duty to use only permanent pigment colours. My tests of Shin Han some years ago showed that their products were extremely impermanent; maybe they've improved the ingredients by now I don't know but at least the CI number of pigments used should be shown on the tube. Thanks for comments Homepride and Simon. Regarding Mission Gold I read all the furore about them on Wetcanvas which didn't inspire much confidence. While I accept things can change your comments about them don't inspire me to change. They are cheap compared to all the leading makes but I'll stick with what I have - which is a mixture. I go for quality allied to price. Simon while some paints may be overpriced generally speaking much cheaper ones are not the same quality overall. There may be paints amongst the cheaper ranges that can be useful but how long is a piece of string?. Personal preference plays a part. Bruce McEvoy of Handprint claimed that certain paints (pigments) amongst the leading makes had dubious lightfastness qualities even though they were given good ratings. it make complete business sence for companies to report false/inaccurate/dubious lightfastness ratings as they want to sell paint and make a profit. for the painter its a nightmare and a maze... most lightfastness ratings dates from the 1980/90's. with no recent ratings. Thanks for further comments Homepride. I fear that with the demise of Handprint and others the manufacturers are no longer under close scrutiny so will backslide. Sad isn't it. ShinHan's marketing is partly to blame. They have 3 watercolour ranges with completely different qualities! To describe them jointly as ShinHan watercolours is useless – like describing the taste of pickles, ice cream, and salad, as a group. I can't tell from the low-res photo, but I think you're reviewing their mass-market, deceptively-named 'Professional' line. What you want is their 'PWC Extra Fine' line. These are their only pro-quality paints. Don't muddy the assessment by calling them 'ShinHan' watercolours; just call the pro line 'PWC', ignore the lesser ranges, and no one will get confused. Thanks for comments. However you say 'I'm muddying the assessment' implying I'm misleading people. 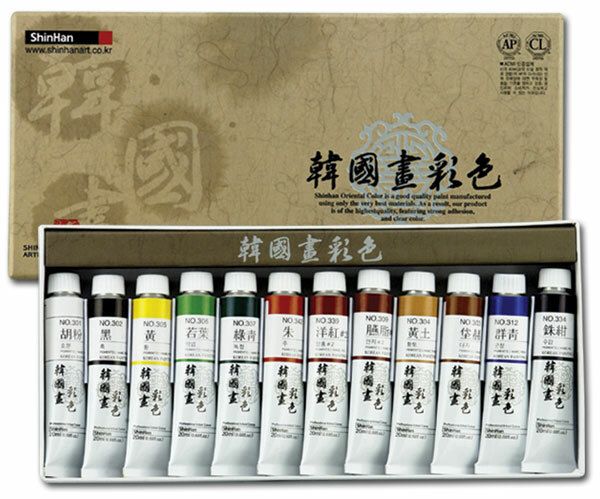 I can only reply that the paints I reviewed are sold by Jacksons (and others) as 'Artists Quality' and as far as I can find are the only Shin Han watercolours sold in the UK. Nobody sells all three ranges you mention unless they are misnamed so. In fact this was reported in a post before but I can only report on whats available and what the suppliers say about them. I have copied your e-mail to Jacksons and asked for their comments.